Reality Check: What's been going on with pay? The claim: Workers' living standards have been falling far too fast for far too long. Reality Check verdict: Average pay adjusted for prices has been rising for the past couple of years, but is still below the level it was 10 years ago, before the financial crisis. 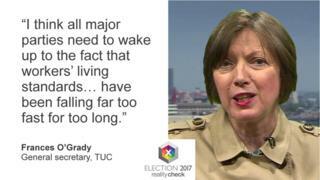 Frances O'Grady, general secretary of trade union umbrella body the TUC, has been talking about pay on the BBC News Channel. "I think all major parties need to wake up to the fact that workers' living standards… have been falling far too fast for too long," she said. The usual measure of whether living standards are falling is whether pay is rising faster than prices. This chart adjusts average pay for changes in inflation, measured by the consumer price index (CPI), to give real average earnings. It's been a tough 10 years for pay. Real average earnings have still not returned to the level they were at before the financial crisis. If prices are rising faster than wages then people's spending power falls. In the last few years, low levels of inflation have meant that pay rises have on average outstripped price rises. But inflation has now been boosted, partly by the rising price of imports caused by the falling value of the pound since the EU referendum was called. You can see from this chart that average prices and pay are currently running at about the same rate. While real wages are still below their pre-financial crisis levels, they have been rising since the autumn of 2014, although that appears to have stalled now. But all of these figures are based on averages, which do not help with the experiences of different areas and sectors of the country. Many workers in the public sector have had pay increases capped at 1%, which has generally been below the rate of inflation. Levels of pay vary considerably throughout the country, with average earnings on the whole higher in the south-east of England than in most of the rest of the country. Average pay has also grown faster for people who have been in jobs for more than a year, which some people have interpreted as meaning that it is new jobs being created that are dragging down average pay. However, it may also be argued that it just shows more stable jobs tend to be better paid. Bank of England governor Mark Carney warned last week that "wages won't keep up with prices" this year, meaning "a more challenging time for British households". The latest figures for inflation will be released on Tuesday, with average earnings being updated as part of the labour market figures on Wednesday. Video Reality Check: Why are wages being squeezed?